President Trump's 'zero tolerance' policy to criminally prosecute anyone unlawfully crossing our southern border causes children to be separated from their families. It is a devastating human tragedy that promises to leave these children with deep emotional and mental scars for life. All of us in New Mexico, leaders and ordinary citizens alike, have an absolute obligation to raise our voices in strong opposition, being on the doorstep of where this is taking place. Unfortunately, our Governor has endorsed Trump's inhumane policy, and should be called to account. On March 15, 2018 the Grant County Beat published my article – Praise and Gratitude for My Silver City Health Care Experience. This article referred to my highly successful total hip replacement performed by Dr. Robinson. I sincerely thought that my writing could have an effect on the decisions of the Grant County Commissioners, but I guess not! My article, along with others that I read, seems to have had no effect. I am terribly disappointed; however, I’m making this one more effort to extend my wish for the Gila Regional Medical Center to remain as it is. Believe me, I’ve had even more experience since my first article was written. In recent decades, the structure of the New Mexican family has changed significantly. For example, grandparents raise young children, and single parents struggle to make paychecks stretch for another month. Even the most idealized families must now watch as their children combat — and sometimes fall prey to — drugs and alcohol at increasingly younger ages. In these trying times, a village is not always enough. Sometimes, it takes a state to raise a child. Addition:Why no decision on Gila Regional Medical Center? The Grant County commissioners have been gathering information on health care and hospitals, including Gila Regional Medical Center for more than a year. Commissioners began the process in March 2017, when the hospital was facing dire financial issues. In June 2017, they approved a contractor with perceived expertise, Juniper Advisory. The Juniper Advisory website states its principles: Juniper was founded on the belief that a critical need exists in the hospital industry for an advisory firm which is both qualified to provide experienced and dedicated strategic advice and free of potential conflicts of interest created within larger, multi-product financial service companies. Sounds good, right? But if you look at Transactions on the website, the first one is expanding. The rest state so-and-so medical center has been acquired by mostly large national firms or have merged or formed a joint venture or entered into a management agreement. The Trump Presidency paralleling a 1943 B-17 Bombing Mission? With the 74th D-Day anniversary just past, picture in your mind’s eye a 1943 squadron of B-17 bombers flying towards their target in Germany. The pilots and navigators are keeping on a straight-line course, the bombardiers intently focusing through their Norton Bombsights—while the rest of the crew, turret gunners, waist gunners and tail gunners are all shooting at the many attacking German fighter planes twisting through the squadron formation—and the flak from German anti-aircraft guns is exploding all around them, buffeting the B-17s. Finally over their targets, the squadron drops their payload and returns to home base. Then they reload and fly back to do it again—and again—and again!! Despite being bullet-ridden, their targets are hit! 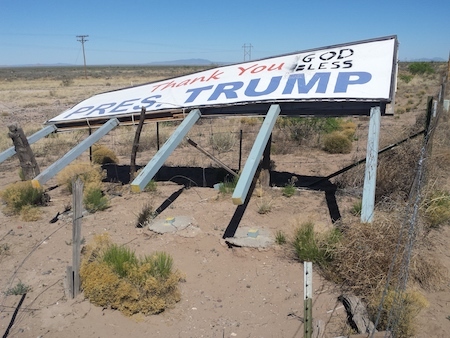 Since my previous article from a few months ago which discussed the defacing of a billboard carrying a pro-President Trump message, we have again seen how spiteful some of our fellow citizens can become. Previously, portions of this sign were painted over with obscenities and fired upon with a shotgun. This time, individuals who are obviously anti-Trumpers proceeded to cut down the sign entirely making sure that a message that they do not agree with could not be seen and enjoyed by others. One of the great frustrations as a candidate for public office is dealing with folks who hear what they want to hear, no matter what you actually say. Such is the case with Peter Burrows May 18 column. In his zeal to paint me as an eco-nut, he has repeatedly misrepresented what I said at a recent PRC candidate forum. He leaps to conclusions about energy storage and renewables with little understanding of electrical grid operation and economics. LAS CRUCES, NM – Dr. Gavin Clarkson, a former Trump administration official and business law professor, filed a lawsuit today against New Mexico State University alleging wrongful termination, breach of contract, denial of due process, defamation, creation of a hostile work environment, and racial and religious discrimination because he is a conservative pro-life Christian and also an enrolled tribal member running as a Republican for Congress. Among other things, Clarkson's suit seeks a temporary restraining order enjoining NMSU from processing his termination until all internal appeal processes have been exhausted.